If you follow my blog, then you know that I have been asking for positive thoughts and prayers for my brother and sister in law of Eagle River, Alaska. 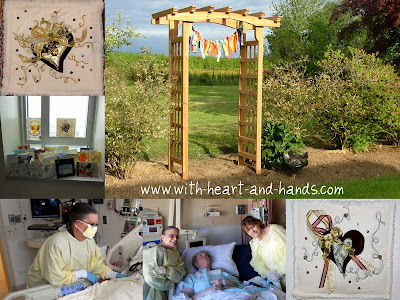 But it has been so incredibly challenging, that I have not given a full update since I was first in Anchorage in June with my brother and sister-in-law and the rest of our family and then in Seattle in July as my brother was medvaced south to Harborview Medical Center, there. As many have written and asked for an update and continue to offer thoughts and prayers on our behalf, I have added bits and pieces to the original post but decided to write a new entry with more details. In my heart, I believe that even the simplest thoughts of anyone reading this will impact our own spiritual energies, and connection with all of our ability to love and all manifestation of miracles. And yes, thank you SO very much for all of that! My brother, Douglas Savikko,of Eagle River, Alaska, was rushed to the hospital after many months of being ill and missing constant work in his practice as a doctor, with some kind of re-occuring case of the 'flu'. He was rushed to the ER on June 8 and diagnosed with acute Pneumonia, which turned into MRSA, and then an auto immune massive brain inflammation and seizures. He spent all of June in Alaska Providence Hospital in Anchorage, Alaska fighting for his life, on a ventilator, and with constant brain inflammation and really bad brain seizures. We were told he would most likely die and I rushed up and stayed with family at his bedside for 9 days until we knew he would live. During this time, he was given such massive doses of sedatives that they admitted it was five times greater than any amount they had ever given any other patient in the hospital and should have been enough to sedate an elephant...a very large elephant, yet he continued to fight to come out of the sedation. To save his life, and any to prevent additional brain damage, they felt they had to administer these extraordinarily high doses of extremely strong sedatives to put him into a deliberate coma and did so until quite literally, they ran out of both of the sedatives they were using....even after using all of the ones from all of the hospitals, in Anchorage and asking for more from the 'lower 48' to be express mailed up. Finally, with no sign of real improvement, they admitted they did not understand what was happening to him, and thought it best to medevac him south to Seattle where they hoped doctors with more neurological experience in these cases might better help him. That day, they medvac'ed him out on a small Lear Jet..still in a coma... to Seattle's Harborview Hospital. This took about 6 hrs of flying time and massive amounts of equipment and several paramedic/nurses monitoring every level of sedative, antibiotics and the ventilator that was completely breathing for him at that time. I flew back from Anchorage, to Salem Oregon where I now live, and then repacked my bags and was driven up to Seattle to be with him, there, as well. I am blessed to be able to share my own healing gifts with others and knew in my heart that I needed to be with him as much as I possibly could. My brother then spent all of July in Seattle, Washington with his life no longer in jeopardy, but his diagnosis as well as any real prognosis uncertain. But the seizures had had stopped and his deep, deep sedation was lifted slightly, bit by bit. I moved to Seattle by his third day there and lived in a hotel for an entire week, visiting his up to four times a day and also visiting his wife, Rebecca , who had flow down in a commercial jet as my brother was medevaced in a medical transport jet. Rebecca, who is in end stage kidney failure and on the kidney transplant list, slipped on her very first day in Seattle, in the hospital, and broke her pelvis. My brother was on the third floor and my SIL on the second and I spend my week walking 16-42 blocks a day to and from the hospital for multiple visits with both of them..all day and evening long. My brother has now spent all of the month of August, and September, at Vibra Medical Center, in Portland, Oregon and now has been moved in the Hillsboro Rehabilitation Center in Hillboro, Oregon. We used a medical transport from Seattle to Portland so as to maintain all of his oxygen assisted breathing through his tracheotomy, and keep him stable and free of the brain seizures. And a regular van transport ambulance to get him to both hospitals/rehab centers in Oregon. He had his trach tube removed at Vibra and it has healed beautifully. He can sit up with a two person assist, be moved into a wheelchair, and is beginning PT to learn to reuse his body after being bed ridden for almost 4 1/2 months. December Update: My brother, Douglas Savikko of Eagle River, Alaska has been blessed by a miracle. He has survived being in a coma for many, many months, on a ventilator for longer than average useage, had a trach/tracheostomy for several months, come out of his coma in his coma, learned to mouth words, then speak with a capped trach, then learned to speak, to use his arms, then his legs, and is now walking with a walker and being released to his daughter's home to rejoin his wife, who is staying now in Beaverton, Oregon. He has most of, if not all of his faculties, and is working to regain memory gaps from the long confine, the horrendous seizures and brain inflammation or encephalitis. Doug is walking, talking, living, remembering proof that prayer and postive thinking, hard, hard work and the love and devotion of family, can work miracles. He will continue to live and recuperate their as his wife, Becky continues to seek her own medical care. His wife, my SIL, Becky, moved to Beaverton, Oregon to be nearer to him in Portland, and is staying with family, there. 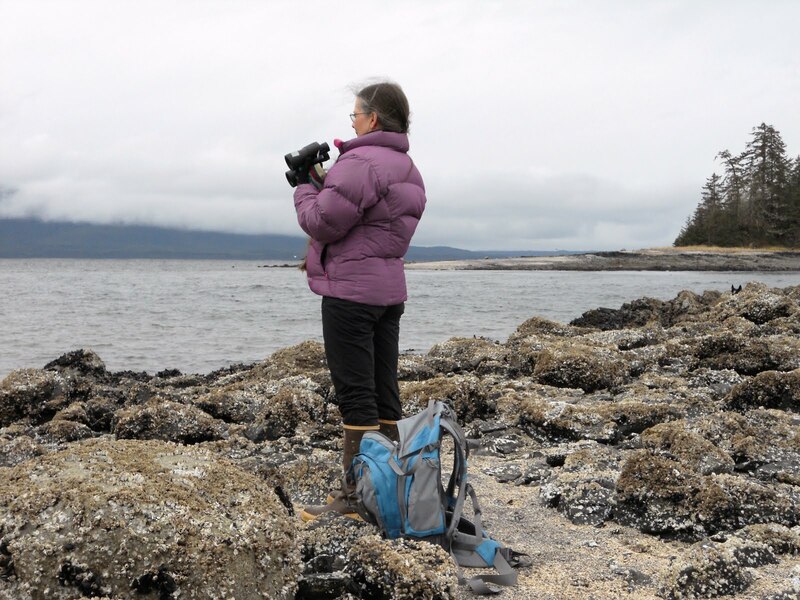 On her first few days there, she fell and broke her pelvis..on top of recuperating from the broken and surgically repaired hip she underwent in Seattle's Harborview Hospital. Becky now has end stage kidney disease, a healing hip and a healing pelvis..and yes, she also has diagnosed Osteoporosis. I drive from Salem, Oregon to Beaverton for visits with my brother and my sister-in-law at least once a week, but often twice, now as we also have other family members in our crises that need our attention, as well. Our visit days are 8 to 12 hours long ...with 4.5 being driving on freeways and Interstates...depending on I-5 and I-205 gridlock patterns. But it is all worth it to have been part of the incredible progress that I have seen during all of these months of this experience and my traveling to three states and three hospitals to be part of his healing progress. As each doctor in each hospital has told me..."This has actually been very amazing progress. We cannot believe how much better he has gotten, he has far surpassed anything that we ever thought he was even capable of, here!" Original posting follows, not using updated terms etc. Doug went from first opening his eyes and smiling at me in Seattle at Harborview Hospital to actually recognizing me and smiling and by the end of the next month in Portland to mouthing words which I then attempted...fairly well, I might say...to lip read. When I first visited him on my own, he asked me "How are Becky and the kids?" So, then I knew..he was back and he was in there!!! After our visits to Doug, we take my SIL, Becky, out to lunch, and run errands that she needs to run. She has truly appreciated and enjoyed this time as she has been able to spend hours at a time with Doug, and to shop for clothing and other necessary items as she only came down with a small suitcase and a carry-on bag (she had only a few hours to pack and get on a plane) and all of her clothing was summery. Last week, we also brought her to a hair salon where she had her hair shampoo'ed and cut and styled. That alone, made her feel 200% better! And the very best of all, even though my brother still has oxygen assist with a tracheotomy, he had the vent capped and was able to talk!!! Now, talking at that point was like listening to someone with a mouthful of marbles and wind blowing through them. We caught bits and pieces. But what we did hear made us all laugh. Some some of his first new words were: "I want some iced tea." Right now, with the venting and the resulting confusion in his throat between trachea and esophagus, he cannot have anything...not even ice chips... by mouth. But we are hearing through the medical grapevine that he hasn't given up. He asks every single person who enters the room for a drink. He gets his mouth sponged out..and I don't think it is with iced tea!! Wednesday, was a really amazing day. I had remembered seeing a news story on Christopher Reeves many years ago where they talked about his swallowing air to aid the voice box in vibrating with a trach and creating words better. So, I just keep reminding Doug of that, and he is much more easy to understand now. We actually had conversations and his use of vocabulary and language usage were amazing. Becky told Doug, that my husband and I pick her up and bring her over to see him. Doug turned to my husband said: "I hope you don't let them interfere with your egress." Egress??? I said My goodness you have a good vocabulary for someone who spent many months in a coma and is on a vented tracheotomy! I mean who talks with that level of vocabulary usage in real life? Dang, if all of this blessed healing energy has made him smarter than me I am in for a rough time. I'm supposed to be the older and wiser sister ;) And up to now, I've been able to talk, talk, talk at him and he hasn't been able to say anything back. Things are obviously changing....ha!! I absolutely loved it and frankly, we couldn't believe that after all of this, and so much horrendous potential brain damage, we at least know that he is coming back to us with his verbal abilities and communication skills intact! He does have pneumonia again, and that will delay the gradual progress of getting him free of needing the trach and oxygen assist. But once we do, we are on the lookout for a rehabilitation nursing home with a strong physical therapy program to get his ability to use his limbs and sit, stand, and walk again. Bit by bit, he is getting better. And in spite of her own incredible challenges, Becky is doing really well for a woman who is so very, very sick. End stage kidney disease is a horrible thing but she walks with a walker like a pro and almost keeps up with me and we are having fun spending time with her and keeping her spirits up during all of this. She is now on kidney transplant lists in both Oregon and Washington and sees a new nephrologist next week to see when she begins to send monthly blood sample for testing and then eventually the 6 month program of wiping out her immune system for hopeful kidney donation. Keep the good thoughts and prayers coming. This will be a year long, or even more, process for all of us. But as I told Becky, today. I don't give up on helping people and I don't give up on believing that miracles are not only possible..... but happening for us all the time! Note:Sometimes miracles are not the saving of a life, but the relief of constant pain, or the gift of being able to breathe even with end stage cystic fibrosis, or the gift of faith and belief that we are all more than we think we are or are capable of being. Sharing these gifts is not something I can delegate, or refuse...as I truly believe this is my own personal spiritual journey in this life time. I just keep trying to help others and to make a difference in the world..the best that I can. And often that is through the making and the giving away of quilts that I put my love and healing energies quite literally into each and every stitch. 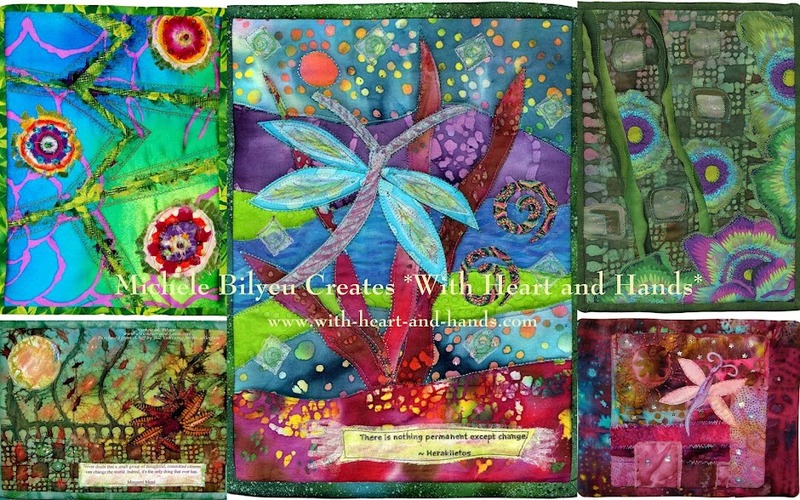 I deeply appreciate your support by the purchase of all of my donated quilts and art quilts to my cherished charitable causes. This link has been mysteriously appearing on other's blogs that I read..you know how google can do things like that with a mind of her own! So, I clicked and reread it. And yep...different people, different problems..but me sewing and quilting and helping others. Deep down inside I always knew I was on what the Buddhists call 'The Short Path'...I'm apparently given so many challenges to learn, to grow, to spiritually progress faster.....yeesh..no wonder it doesn't throw me as hard as it might someone else...I really do live like this most if not all of the time! PS:And also? Could you please help us find a cure for Alzheimer's?.........I love AAQI and I love making and donating my little quilts but goodness, I'd love it even more if we never, ever needed to earn research moneies every again, because a permanent cure was found!!! Our mother is now in her 8th year of advanced Alzheimer's and it has profoundly impacted our entire family. My brothers and sister in laws continue to care for her in our family home in Douglas, Alaska as I help Doug and Becky now in Oregon. 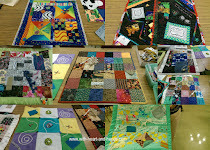 Please support my primary cause and buy my little quilts to earn money for A.D. research. All profits go directly from their sale at AAQI to funding at major research university working on treatments and/or a cure for this horrible disease. So much inner strength in your family! Sending more hugs and good thoughts your way. It certainly has been (and is) a long road, by the progress made is amazing! My prayers continue! Wow! That is a fantastic story of will power, strength, determination, faith and God's amazing grace! Thanks for bringing us up to date with what's been happening. What an incredible journey. Thank you for the update and your courage. My sister still has her challenges but your prayers and support encourage me. God bless. You and yours remain on my prayer list. At mass I take a few extra minutes to let God know there is need. OH, how wonderful your post is today, so joy-full, hope-full, and wonder-full!! I will continue to send love and light♥ and thank you for reminding me that the smallest, simplest happening/blessing ("I want some iced tea")is worthy of our heart's fullest appreciation. You and your family will continue to be in my thoughts and prayers. It is so good to read your update and the blessings that God is showering on your family. Thank you for the re-cap. What an amazing journey for all of you. My thoughts resonate with yours. May all of your journeys be filled with gratitude and appreciation for the the blessings you have been able to give to one another and to others. The prayer flags are a flying Michele! Thank you for keeping us informed! 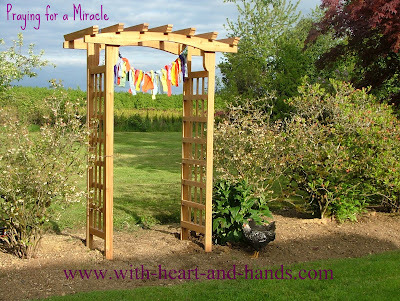 Your words on miracles are so refreshing and insightful - a trua blessing to read! God is so good! These are wonderful stories and it is so good for me to be able to have you share them with us and to remind me of so many things I take for granted when sometime all I want to do is complain about how hard life is. They are all very lucky to have you help them. Thank you for all you do, you always give me so much to think about. Thanks for the update! What courage you and your family have. I think when we have good health, we take a lot for granted. When I hear of people struggling with serious health issues, it humbles me. I have a friend with multiple myeloma, has been battling it for over 4 years - one round of chemo and clinical trials after another. It really puts everything in perspective. If you have nothing else, but have your health, you have everything to be grateful for. I will continue to keep you and your family in my thoughts & prayers, praying for a full recovery for both your family members. It is good to hear some encouraging news about your brother. Wishing you and yours continued strength and courage. I had just made a big jug of iced tea before I started reading your post. So here's to all the good news and to you for being such a special person. Everytime I read your blog I usually have a tear and a giggle and am reminded how precious life is. Thank You!!! And I will keep the prayers heading your way. Mis oraciones están con toda su familia .....espero un milagro para su querido hermano. You and your family never cease to amaze me. With all the problems you encounter you somehow keep on rolling and your optimistic attitude always shines forth. May God bless you all and give you strength! Sending prayers and love! Bless you for all that you do. I wish others would follow your example and show this kind of support and kindness to families. It's hard enough being in one but when you need help and support you can't always find it. I get the feeling you are someone who is always helping. If you come back and read this again, please write me at michelebilyeu@with-heart-and-hands.com with an email address if you want to recieve updates. Otherwise, bookmark my blog as I update this post with new changes from time to time. But I do have photos of Doug's progress at our private site for those who are family, friends, or patients of Doug's. My father, Marty Lorenz, has been Doug's patient since 1968ish. He is GREATLY relieved by your blog - was afraid that Doug died and no one told him. He says to tell Doug to "I'm sorry that he is not feeling good. Hope he feels better soon, I really miss him. My dad, Marty Lorenz, has been his patient since 1968 and is GREATLY relieved to hear the news that Doug isn't dead. Says to tell Doug that he hopes he feels better and comes home soon as he really misses him. Mary Carhart, Dr. Savikko was our family doctor for 15 years and boy did he do wonders on my neck and back. Always walked out of his office feeling lighter and blessed by his touch. Prayers continue for Dr. Savikko and his lovely wife Becky.